There are a lot of rail operators across the United Kingdom & Europe. 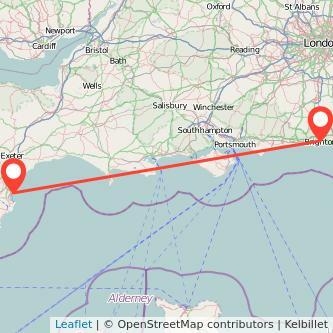 By searching for your ticket on gopili, you are able to see the trains between Brighton in England to Torquay in England as well as the rail company for this route. Using the train is a fast and convenient way to travel the 150 miles from Brighton to Torquay. Find the cheapest tickets to travel from Brighton to Torquay by train, bus, ride sharing and plane. We compare train ticket for all major companies to travel between Brighton and Torquay by train and find the best prices for the coming days. Take a look at the prices of train tickets Torquay to Brighton and find the best deal for your outbound journey. Looking to travel for less? Many railcards and discounts are available to spend less for your Brighton Torquay train ticket and save even more money on your tickets: special train fares for children, railcards for all ages, group travel, or charity discount. There are five types of railcards available: 16-25 railcard, Two together railcard, Family and Friends Railcard, Senior railcard, Disabled persons railcard. As an example, train tickets from Brighton to Torquay cost on average £50.00 (1). If you're dividing £88 by £50.00 (£88/£50.00 = 1.76), it turns out that after only 2 one way journeys from Torquay to Brighton, the railcard will have paid for itself.